If you've read any pie recipe on my site, you've probably heard me wax poetically about how much I love to make pie. There's something about a homemade pie made completely from scratch that is so special. 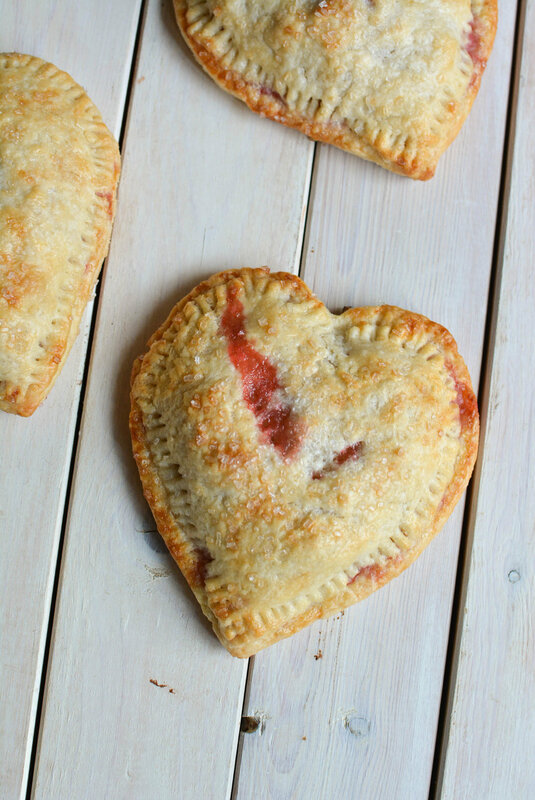 I love the rustic look of pies, and how they don't have to be perfect to be beautiful. I hope you get this feeling after you make your own pie crust too! 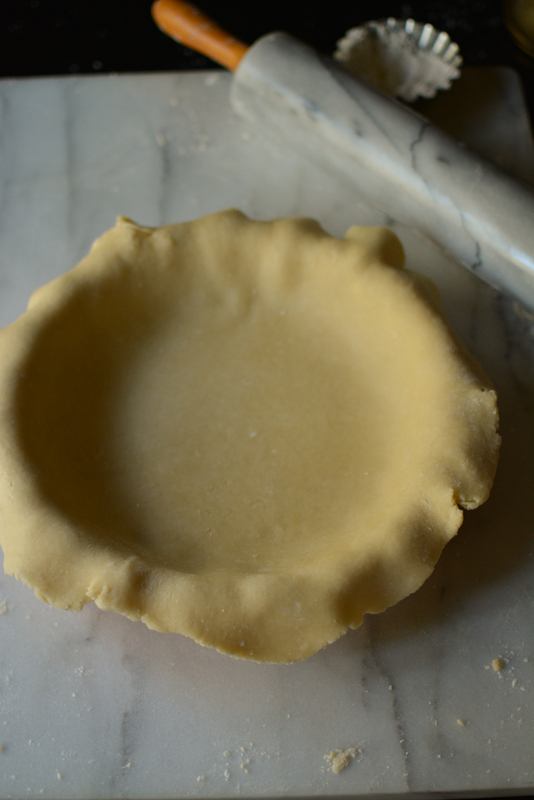 Pie crust can make or break a pie for me. It's got to be flaky, tender, not tough, and definitely not soggy either. The ingredients are simple, flour, salt, butter and water. What makes it so complicated, you ask? It's all about the technique. With so few ingredients it's important to get the technique right. It helps to understand WHY each step is so important. Probably 90% of baking recipes you will see require "room temperature butter". Not for pastry dough, however. Butter plays a key role in creating the delicate flakiness of the pie crust, and only if the butter is incorporated correctly and COLD when it goes into the oven. 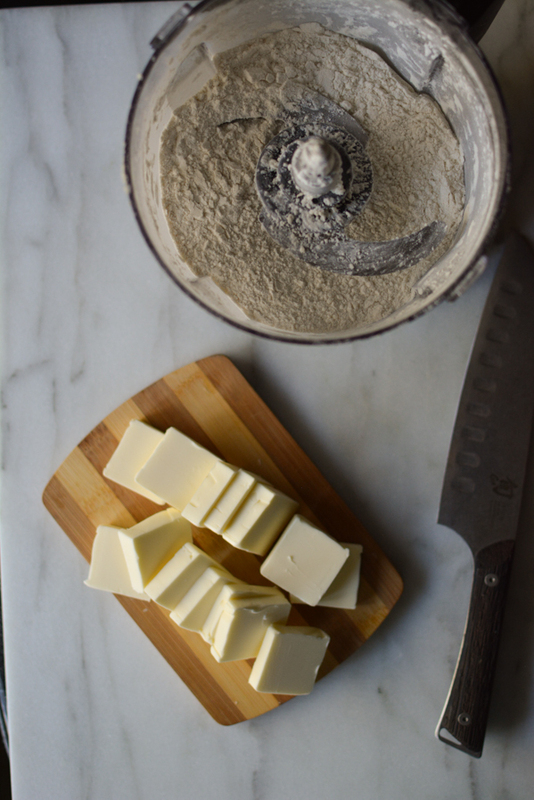 Tip: Cut the butter into cubes and place in the freezer 10 minutes before you need to incorporate it into the dough. This way it will be ICE COLD. 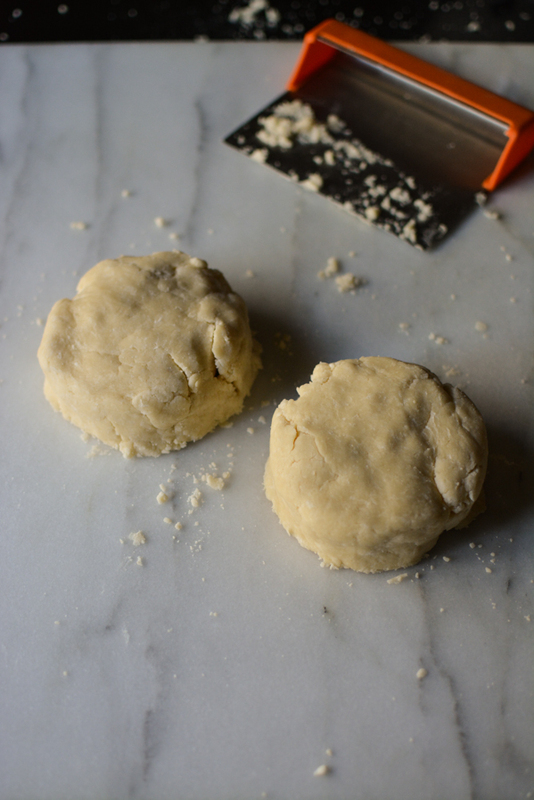 It is key to remember when handling the dough (every step of the way) that you don't want to warm up the butter in it. Here's how often I stick it back into the fridge or freezer: Cut butter into cubes (freeze). Incorporate into dough (chill in fridge). Roll out and place in pie plate (chill in fridge). Fill with pie filling (freeze, if it's a fruit pie). The butter should get mixed with the flour enough but not too much. Simple, right? When put into the oven, the small chunks of butter inside the dough will create little steam pockets, and where the solid butter once was becomes an air pocket, thus creating a tender flaky crust. If the butter chunks are too big, you'll have melted butter leaking from your pie crust as it bakes. If they are too small because they've been worked into the dough too much, you won't have as much air separating your layers, producing a more dense crust. Tip: Aim for chunks of butter the size of peas. Overworking the dough breaks all the other rules above. It warms the dough, softening the butter, which then ruins any butter pockets that were created, forming a cohesive dough that will be tough. The butter helps moisten the dough a bit, but that is what the water is for. 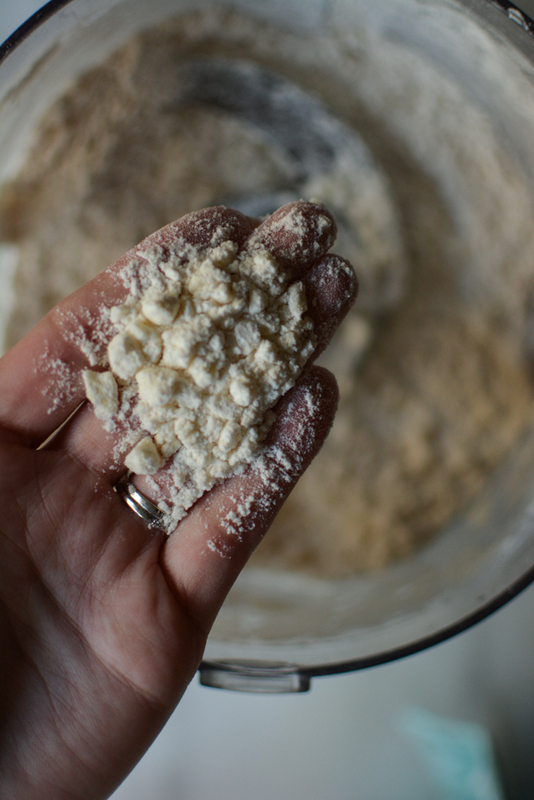 The water mixes with the flour to hold the dough together. However, once water is added to the flour it will start to develop glutens, which are the proteins that give it structure. A small amount of glutens are good to give the dough structure, but too structure makes a tough crust. While the butter chunks incorporated do interfere with some gluten formation, it is important to keep it's formation to a minimum. Too much water will aid in more gluten formation, and give a tough and gummy dough. And over working the dough only strengthens and elongates the network of glutens, which you do not want. 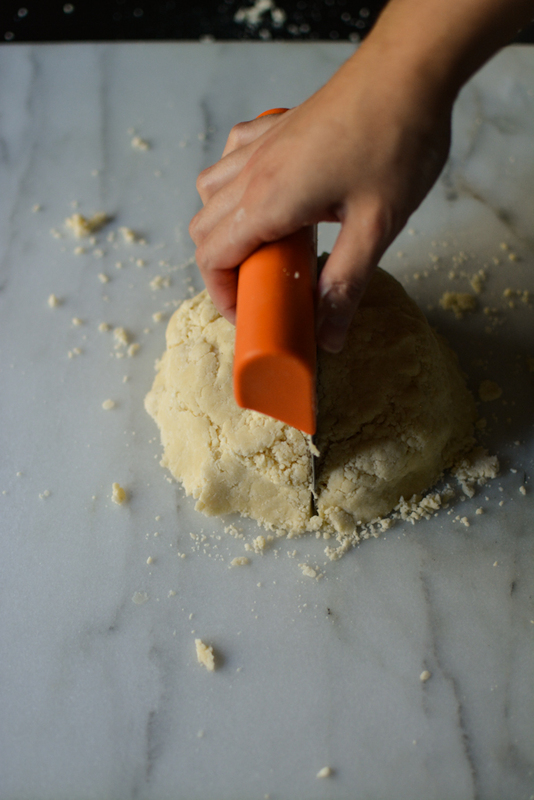 Tip: Gently handle the dough, being careful not to overwork it. If it starts to become elastic, let it rest in the fridge for 10 minutes before rolling out any more. Now that we've covered those fundamentals, let's get into it! First, flour and salt are mixed together. Then cold cubed butter is pulsed in. I hold down the pulse button for 8 seconds to get the butter chunks the right size. Next, the ice cold water is pulsed in. Pour a steady stream of ice cold water (1/3-1/2 cup) into the dough while it's pulsing. Don't pour it all at once or you'll get a gummy flour/water mess. Add just enough water so the dough sticks together when pinched between your fingers. It will still look crumbly, but will be hydrated. 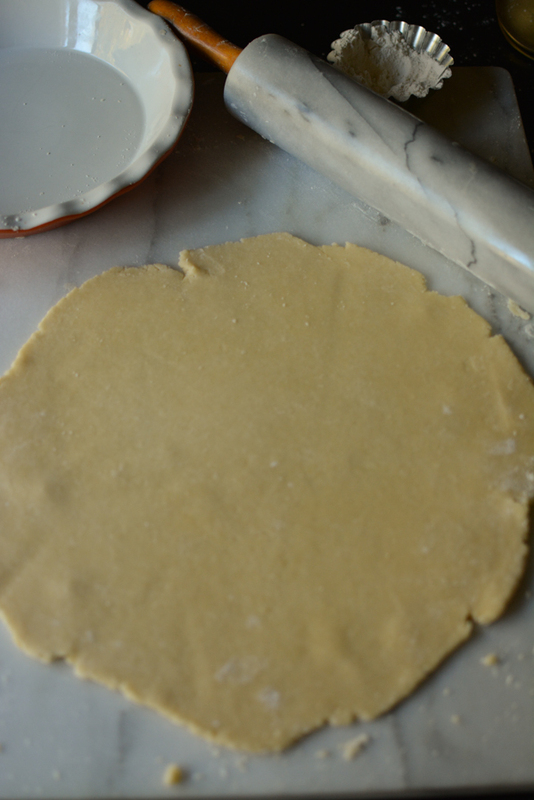 Dump the dough out onto your work surface and gently form it into a disc. Cut the disc in half, and form two discs. This recipes makes one double crust recipe. Wrap each disc in plastic wrap and let it rest in the fridge at least 30 minutes. You can make crusts ahead and keep in the fridge a week or two, or in the freezer for a few months. After the dough has rested for 30 minutes, remove it from the fridge and let is sit out for 15 minutes before rolling. If you roll it when it is too cold your dough will crack. 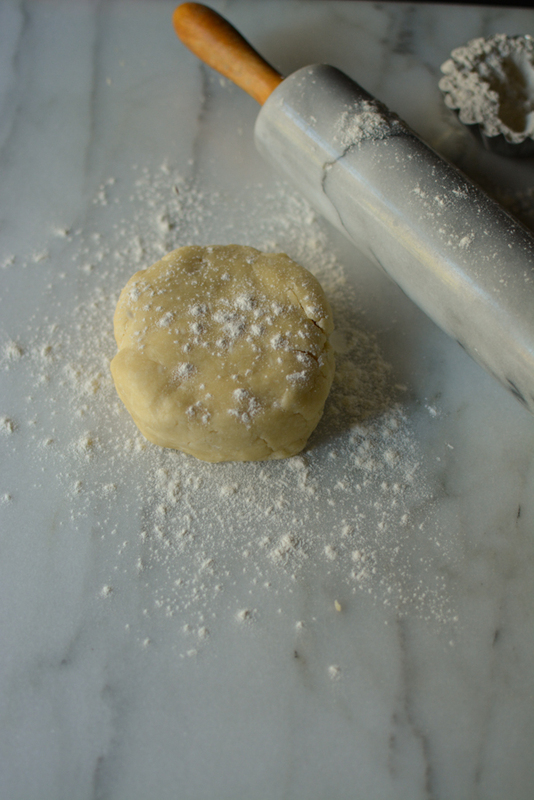 Dust your surface with flour, and dust the dough with flour. 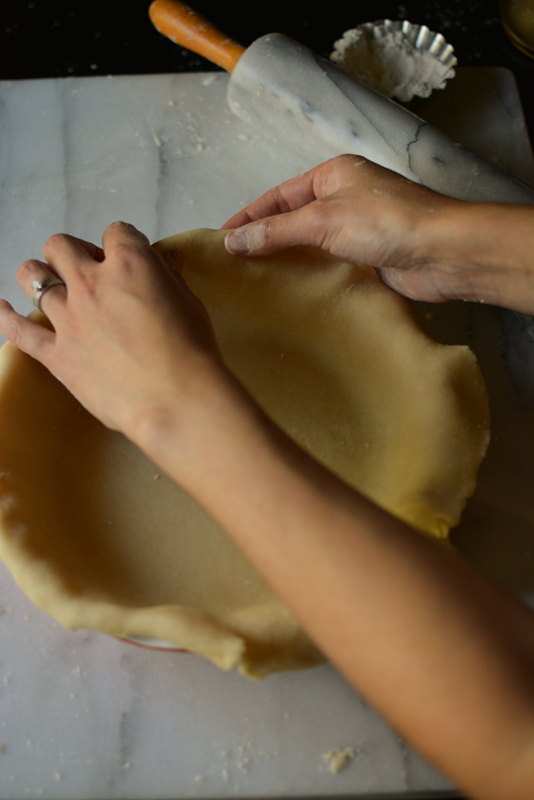 For a 9-inch pie plate, roll the dough out to 13 inches or so in diameter. 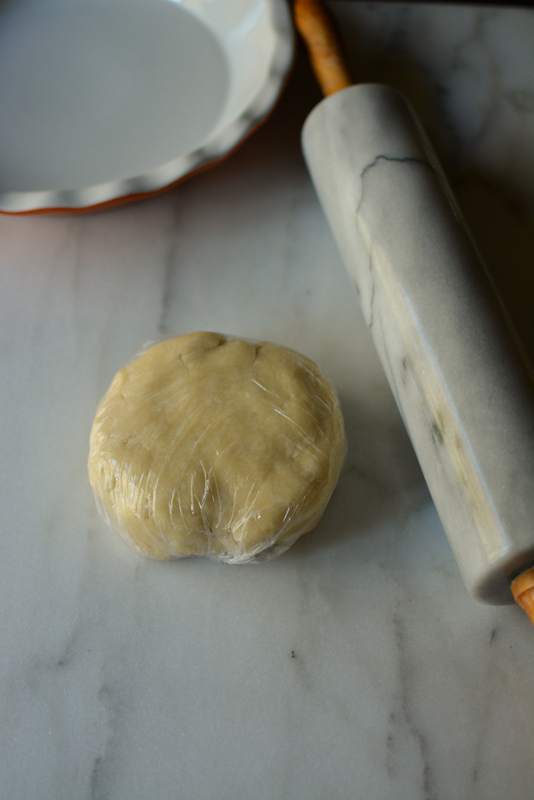 Don't over work the dough with the rolling pin. If it becomes elastic or starts to get too warm, pop it in the fridge for a few minutes before continuing. 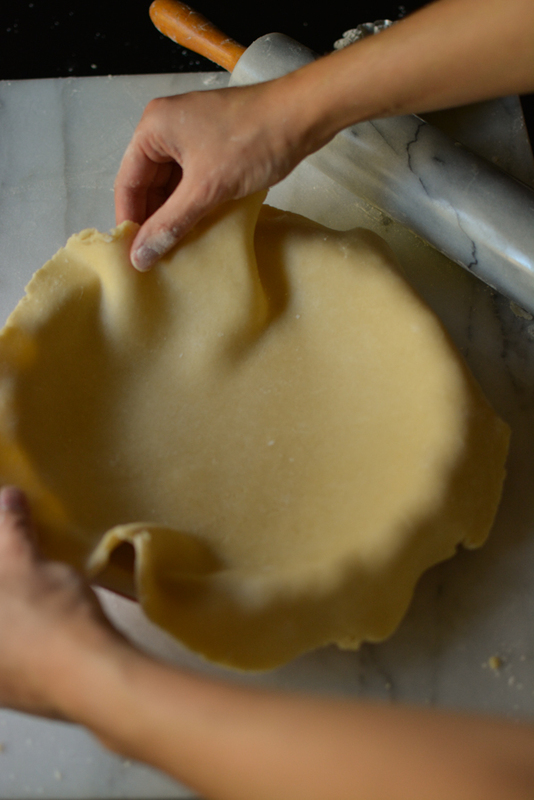 To be sure of the size, hold your pie plate over your rolled out dough to see if the diameter is large enough. You want some extra overhang to make your crimped edges. Gently fold the dough over in half, and set into the pie plate. Unfold it, and carefully adjust if needed so the overhang is even around the entire edge. If you have more than 1 inch overhang, use scissors to cut it. Tuck and roll the edges under. Then crimp the edges. You can use your fingertips for smaller crimps, or your fingers/knuckles to make a larger wavy crimp. 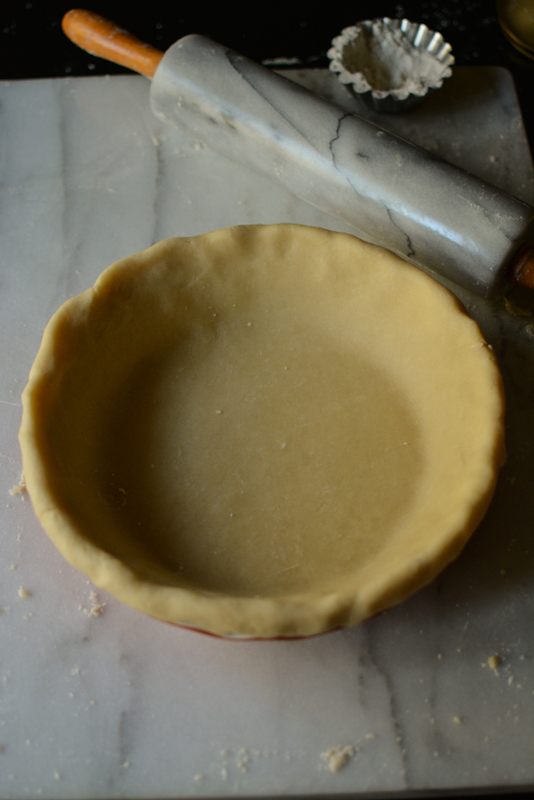 Put the pie crust in the freezer or fridge until you're ready to fill! And there you have it! 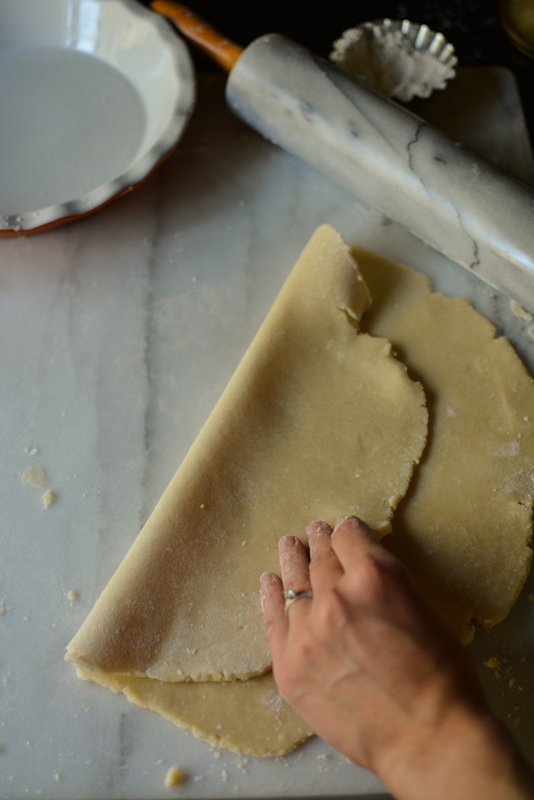 Pie Crust 101. Good luck and happy baking! 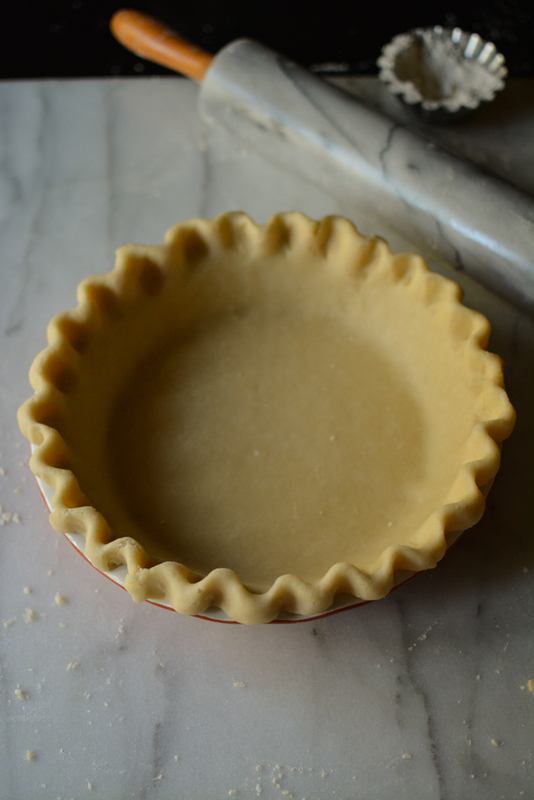 This all butter pie crust is a staple for sweet and savory pies. 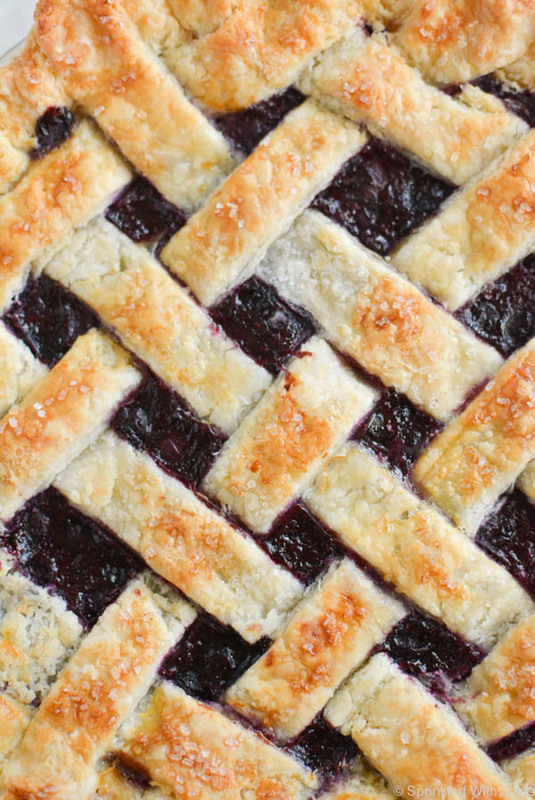 Complete with a tutorial, this pie crust will become you're go-to recipe. 1. 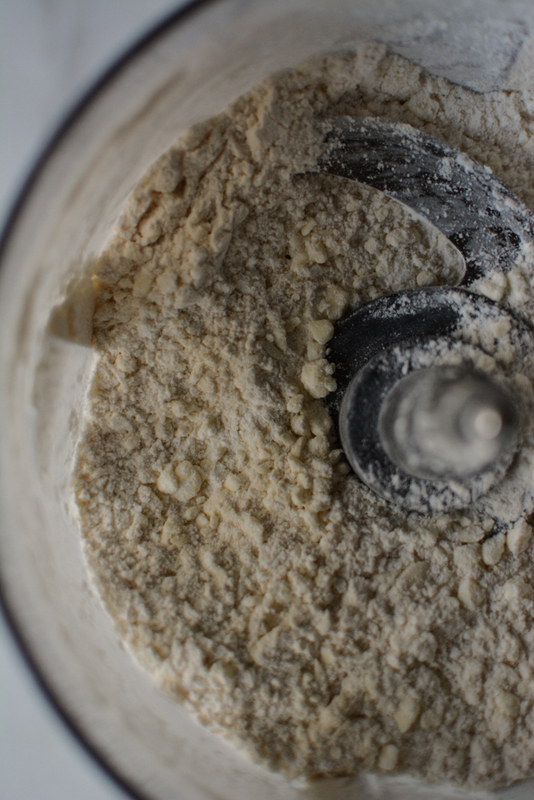 In the bowl of a food processor, pulse together flour and salt. 2. Add the cold cubed butter and pulse until butter chunks are the size of peas. 3. 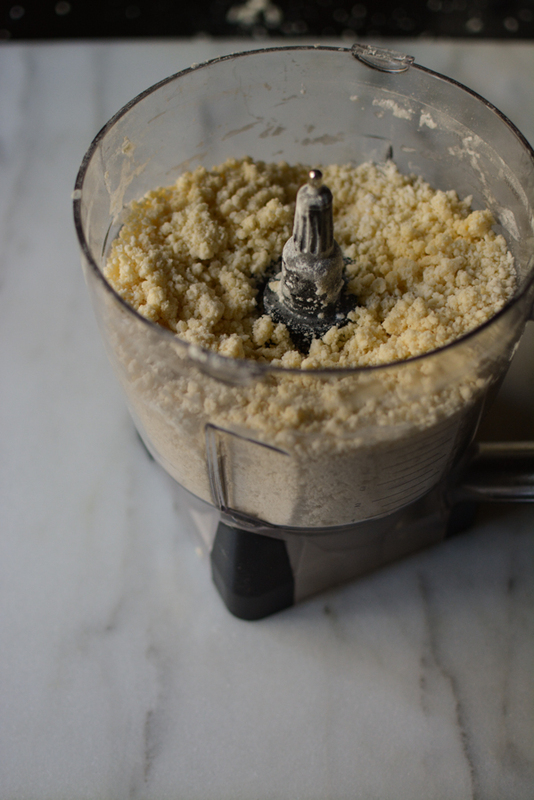 Slowly stream water into the dough as you pulse it in the food processor until the dough is hydrated. Dough will look crumbly still but will hold together when pinched between your fingers. 4. Turn dough out onto work surface and gently form into a disc. Divide in half, and then form into two discs. Wrap each disc with plastic wrap and let it rest in the fridge for 30 minutes. 5. Dust work surface with flour. Let the dough sit out for 15 mintues before rolling. 6. Dust dough with flour and roll out to about 13 inches in diameter. 7. 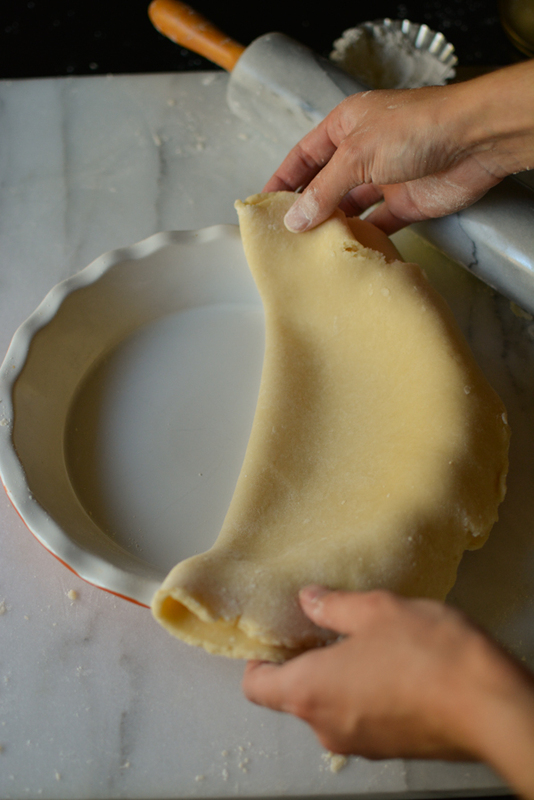 Fold dough in half, and gently place into pie plate. 8. Unfold, and adjust so the overhang is even around the entire edge. 9. Tuck and roll the dough under itself at the edges. 10. Use your fingers to make crimps around the edges.